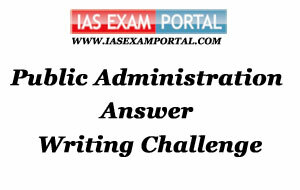 Weekly Mains Exam 2017 Answer Writing Challenge - Public Administration "MODULE- 64" | IAS EXAM PORTAL - India's Largest Community for UPSC Exam Aspirants. Weekly Mains Exam 2017 Answer Writing Challenge - Public Administration "MODULE- 64"
Public Administration- Paper I "Syllabus Topic – Financial Administration: Budgets - types and forms"
Q1. Delhi government’s Outcome Budget for 2017-18 is a unique effort towards accountability. Comment. Indian Administration- Paper II "Syllabus Topic – Law and Order Administration : Reforms in Police"